In the nineties Marathon was unmistakably one of the best Dutch progressive rock bands, often compared to bands like Saga, Marillion and Rush. Their albums The First Run (1994) and Norm (1996) are highlights of the Dutch prog rock scene. Their last physical evidence was the live album Marathon Live (1996) recorded as a farewell album for their fans. Personally I never understood why they decided to split up in two different bands. La Villa continued the progressive rock style and e-Norm (later on renamed to ENorm) would perform the more radio-friendly music. At the time I was very disappointed that it turned out this way. I guess the three former members, lead singer Eric ten Bos, his brother guitarist Ronald ten Bos and drummer Ferry Bult, after a while felt they still had a progressive rock heart. They started doing concerts under the banner of “Marathon by ENorm” and played lots of songs of their former band. 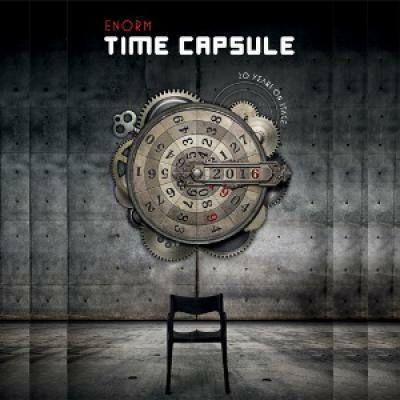 Exactly twenty years after the break-up of Marathon the band ENorm releases Time Capsule - 20 Years On Stage. Time Capsule - 20 Years On Stage is a video retrospective of their career on 2 DVDs looking back on their musical career starting as Marathon in the nineties, evolving into ENorm to their great “Kerst met Ballen” shows and the charity singles they released. The DVD contains footage of concerts the band did between 2010 and 2015. In the booklet you can read all about the history of the band, also when they were still Marathon. As a nice extra you can enjoy pictures taken throughout their entire career. The main dish is of course the footage on both DVDs. They both last almost one hour and contain songs from ENorm as well as songs that were originally recorded by Marathon. The audio and video on both discs is of a very high quality, with lots of cameras perfectly capturing what happens on stage and great close-ups of the individual musicians. Sure, my heart beat faster watching the band perform the old classic Marathon songs, like Casanovas, Ozone Layer, The Beauty Of Silence, The Patterns Of The Landscape, Medicine Man and Beyond The Veil. Maybe they even performed the songs better then in the old days! At first I was prejudiced about ENorm's music, because they were not really a progressive rock band. But after reviewing their latest studio album Finding My Way (2012, see review), I noticed that this band could also come up with excellent melodic songs that occasionally contain a wonderful guitar solo as well. Horizon and High Above The Ground are good examples. Also the ballad Zoe is a very strong piece of music. This song about lost lives is visualized very well with a performance of an elegant girl hanging on a rope. This is not the only song with a message in the lyrics and also not the only song that brings something extra on stage to look at. I will not go into detail, but you better believe they did a very good job! The drum solo was not really necessary for me, but I certainly enjoyed what Ferry Bult managed to do behind his drum kit. My only question about this release is why they didn't include any old footage of Marathon when they rocked the house in the nineties. I know the quality of what was saved from the old days is of a poor level, but I think fans of those days would have loved to see it. Despite the fact there is only footage of ENorm on this double DVD, I have a positive verdict about this release. It shows all the hard work that it took to make this release available. So bravo to all of them who put so much effort into it to come up with such a professional musical document. A musical document in which ENorm steps into their time capsule with us to celebrate their 20 years on stage. Congratulations to the band!